Whatever happened of past users!!! Re: Whatever happened of past users!!! I understand you. I have 3 kids myself. I started climbing only 4 years ago when I was 34 when my youngest was 5 (they are now 9, 10 and 12). But if it is a passion, your wife should understand that and let you climb. At first, you do the less dangerous peaks like Kili, Elbrus, Mt Blanc, Rainier and even Aconcagua. If you feel bad you descend immediately, you don't take any chance. Sure there are always risks but you can minimize those risks by going slower than most and taking more days to climb a route (like Kili in 9 or 10 days). And between the climbs, you take mountaineering courses, ice climbing courses, rock climbing courses, crevasse rescue and so on. I just took my wilderness first aid training for the outdoor leader and my CPR certification. You go winter camping for a few days. Those courses combined with Elbrus and Aconcagua will get you the experience needed to climb Denali in a safe way in maybe 4 or 5 years. It's a long term plan, but in 4 to 5 years, you'll have more time to climb and go in expeditions and you'll be closer to your dream of climbing the 7 summits. Putting your dreams aside is the worst thing you can do, it will destroy you. I should have started earlier than I did, don't make the same error. For Portillo, look at their website http://www.skiportillo.com/home-eng.html, If you go to Aconcagua, you can take a look, it's not even an hour's drive from Puente del Inca. Altitude record 6654m. Next summer (2011) will try to up that to 7546m.. This thread is like a big reunion! Nice to see you all again. I have been climbing a lot lately, so I haven't been so active on the forum. Came back home recently after a nice time in Central Asia. Summited Pik Lenin, Muztagh Ata and some other smaller peaks. For the record; I sometimes have a chat with Daisy on the messenger. Probably heading for South America soon. I hope to climb the rest of the peaks I have left on the list of the highest 25 peaks there. 11 down, 14 to go. All the best, have fun and hope to see you somewhere in the world. I'm enjoying this reunion thing. Daisy, I know you log on, maybe you could let us know how you are doing? I read you might be trekking in Nepal; something I hope to be doing soon. I miss your postings on this site! Thanks for the link on the 6000m peaks in the Andes. Congrats on 11 down...that is awesome!!! Quote: By the way Harry, is that a cucumber down your bike shorts or are you just happy to see everybody? I hope you all don't mind the spectator...... ;-) Nice to see everyone posting again..
Aww Trunl is adorable!!!! Look at that pic. He still claims to have summited Whitney and that his camera got stolen. I was in contact with Buddha "off-site" now and then, but one day he just disappeared. Haven't heard from him for a long time, even if I've sent him a mail now and then. I've been climbing a lot lately in Asia, so I haven't been online much. Still no news from Daisy or trunl. Harry, are you going back to the ice of Antarctica this December? I was wondering if you have considered climbing the highest peak in Canada, Mt. Logan, 5959m (the second highest peak in N.A.) I found this link with basic info and great pix. Btw, how technical is Mt. Logan? Logan is a very interesting target and I have had it on my (very long) list of "interesting peaks for the future". I have thought about kayaking along the coast and climb it from the sea side, but all experts are telling me the plan is extremely dangerous and bordering to not realistic. Therefore I have (almost) resorted to doing the normal walk in if going there. I definitely want to climb Logan sooner than later. The normal route is not that technical, about the same as the West Butress on Denali. But the big difference is that you are almost alone on the mountain which makes for an experience totally different from Denali. The trip report is from a guy from Quebec where I live. Thanks, Corsair and Mike...maybe the two of you can plan a climb of Logan together! Logan reportedly has the largest base circumference of any mountain on Earth. I think Logan would be a great peak to climb; primarily for the solitude. For me, next to the challenge of a summit, the isolation is most enticing. I also want to do a few of the easier 6000m peaks in the Andes. I am working up to these peaks with local climbs in my area (the NW.) Hoping to do Rainier next summer. Speaking of solitude, check out what Simone is up to. A winter ascent of Broad Peak and maybe K2....solo! Beautiful photos! The colors of Gokyo Lake are amazing. I love the pic of the yak in front of Ama Dablam. What a great trip it must have been. Thanks for posting your pictures. Looking sweet as ever. I mean, great pictures, I love that area and you captured it well. I think it's about the same times as apply for Denali, or that's what I've heard. "Possibly a little longer period" I think the answer was on my question, when I asked a guy who has been there a couple of times. Are you seriously thinking about going there with a bike? If so, drop me a line. I'm probably insane enough to give it a go. Quite used to that kind mountaineering approach. But going all the way to Logan...You're joking aren't you? The two first photos are shot during a crossing of the Kunlun Shan. 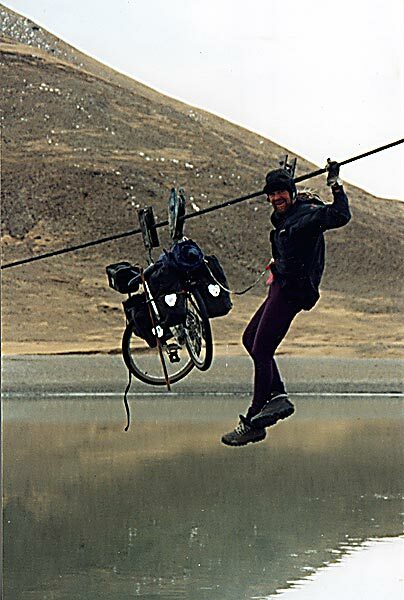 The third shows me trying to cross Tsangpo in Tibet. You're crazy! Biking to Logan, it's in the middle of nowhere with lots of forest all around, so tight that you'll scratch yourself to death before arriving in basecamp. But as for climbing Logan in itself, I'm up for it anytime. Do you wish to climb the Kings Trench route so we can ski down from the summit. THat would be neat! I'm in Quebec a little bit now and then as my girlfriend has her family there. Drop me a line if you need a partner for Logan. I may be around. It's one of the peaks really high on my list. I can't say I was really serious about bringing the bike to Logan. But I'm very easily convinced when something crazy is coming up. Muztagh Ata - 7000 meters.